Vincent DiCaro, the organization’s vice president of development and communication, will moderate a panel on the effects of father absence. Vincent DiCaro, vice president of development and communication of National Fatherhood Initiative (NFI), will moderate a panel today at the Dad 2.0 Summit, an annual conference dedicated to exploring modern fatherhood. The panel, titled “Male Scarcity and the Impact of Absent Fathers on Communities,” will explore the “long-term ramifications of the alarming pattern” of the decades-long increase in the percentage of children living in father-absent homes. Moreover, the panel -- comprised of academics, experts, and sociologists -- will discuss the latest initiatives to help communities and organizations connect fathers to their children. The panelists are Stacy Morrison of BlogHer; Creed Anthony, middle school teacher and blogger; and Mark Trahan of Trahan Counseling. The “male scarcity” panel is a timely conversation in light of growing evidence that high rates of father absence not only have negative consequences on individual children, but on entire communities. However, this crisis is being answered by initiatives around the country to help fathers in a variety of settings and circumstances connect with their children. NFI in particular delivers programs to prisons, military bases, and community-based organizations around the country to help them educate and inspire dads about the importance of their roles. Each panelist will discuss his/her perspectives on these issues. 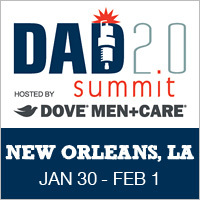 The Dad 2.0 Summit will be held from January 30 to February 1 at the JW Marriott New Orleans. The panel being moderated by Mr. DiCaro will take place from 1:45 to 3:00 pm CST on Friday afternoon.